The ultimate dream for Team Ursa is the ability for schools and researchers to use some of the referene designs which Ursa has developed for educational and research purposes, ultimately inspiring the next generation of students. Our partner, Mavericks Civilian Space Foundation, asks for the assitance of teams like Ursa to generate the open source IP for these reference designs. By sharing design on an open platform vast amounts of development time will be saved, providing an opportunity for schools an students to focus more solely on the payload and onboard science. This easier pathway to sub-orbital space will have many positive impacts on excited young students. Once teams begin using the designs, improvements will likely be developed, and these improvements can be re-submitted. Overall the open source model has the potential to increase the rate of innovation of the small scale sub-orbital research platform. If a school or researcher is interested in using Mavericks reference designs (developed by Ursa or others) please send an email to the address listed on the contact page and we can direct you to the right people. Depending on the location Ursa may be the liason between institutions. For reasons explained below we cannot make any guarantees that designs will be granted, the infrastructure for automatically vetting and downloading designs is currently in process by the Mavericks. Distributing information such as this can run into red tape, learning how to responsibly get past these barriers is in itself a contribution that the Mavericks and Ursa are making to the educational and reasearch community. Ursa and Mavericks will continue to fly research vehicles whenever the volunteer staff is able. Both Ursa and Mavericks continually launch in order to develop the newest reference designs, and to refine new ideas to the point where we can release them to the community. This means that your school or lab could fly something on these research vehicles without needing to worry about possible legal roadblocks (see below). 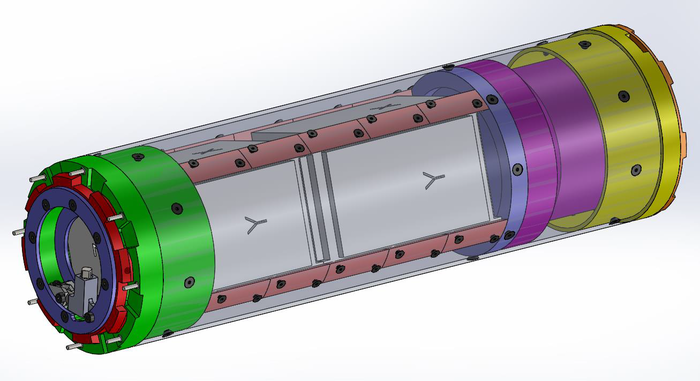 The payload packaging system within most research vehicles use standard cubeSat form factors. Thus, a team need only build their experiment into a 1 or 1.5U CubeSat and Ursa can put it in the next vehicle. The future design pages lay out a roadmap of possible upcoming missions. For more information on how the payload packaging system works please see the design page for more information. Additionally, if you are not familiar with the CubeSat form factor you can learn more about it on their site www.cubesat.org. If this interests you please send an email to the address listed on the contact page. Depending on demand there may be a waiting list, and priority will be given to educational institutions. No guarantee of flight time can be given, and no imminent launch is scheduled at this time. There will be updates on our Facebook pages and website when this changes. Team Ursa is eager to seen our reference designs shared with the broader educational community. Unfortunately, there are many laws and regulations that surround this type of aeropsace technology. This mainly refers to ITAR . Violation of ITAR have serious consequences, and special permissions must be granted on a technology by technology basis. Our partner, Mavericks Civilian Space Foundation, is working diligently on these issues. Once a reference design has been approved for distribution Ursa can begin sharing it more freely, and begin making the open source model a true reality. As these efforts develop updates will be posted to social media. As discussed further up the page, there are ways that schools and researchers can fly with Ursa or Mavericks today. Below are some examples of outreach Ursa has already done, as an augment to the primary educational programs which Maveicks runs. Above is an image of a CubeSat form factor payload (called a PMU, or Payload Management Unit) being loaded with a vibration data logger from Midé Technology. Midé is a small Research and Development firm in the Boston area, and they're always coming up with a cool new project or development. This PMU flew on our Ursa 2.1 research vehicle and Midé got a great real world test of their product! Here is another example of a payload that flew on the Ursa 2.1. Ursa team-member, Ben, worked closely with Deering High School in Portland, ME, to develop a payload with one of their science classes. 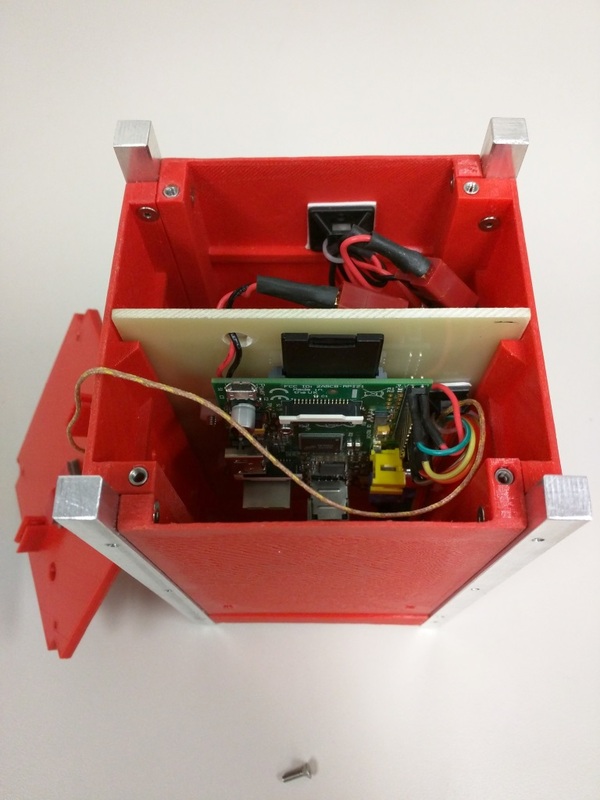 The result was a Raspberry Pi single-board-computer with a thermocouple that allowed the students to track air temperature as the vehicle ascended. 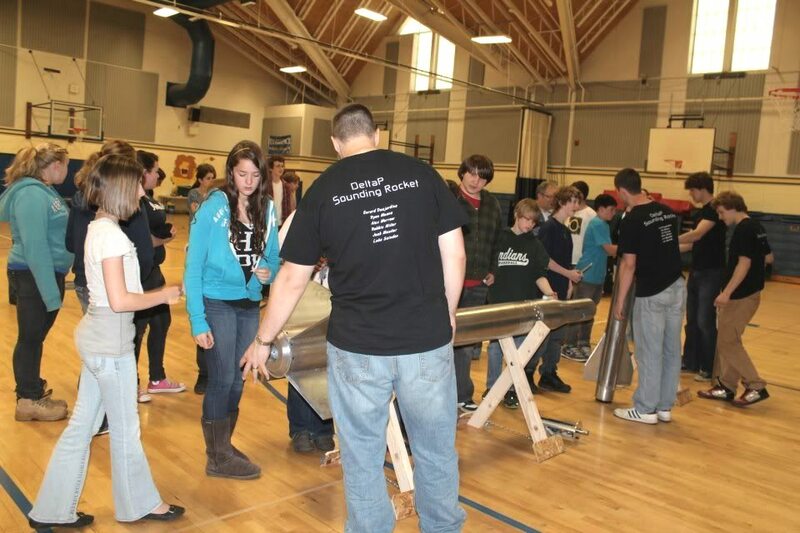 During the time when the team was devloping the Ursa 1.0 vehicle (see the history page) the team was lucky enough to do a show and tell with a local middle school during the spring of 2012. The students were able to examine the rocket and ask all sorts of questions.